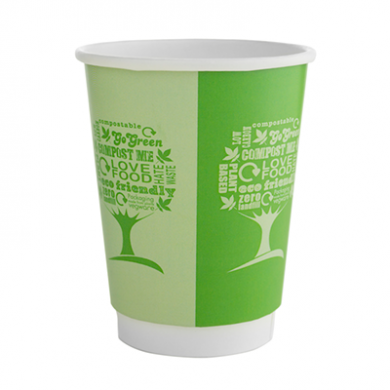 A Vegware special edition 12oz double walled cup, part of our Green Tree collection. A tree-shaped word cloud celebrating sustainability. Shout about your eco credentials. Disposable hot drinks cup with a tree-shaped word cloud. Material: Two layers of board with plant-based PLA lining.